HSC admission of 2016 session will be started on 26 May this year. Earlier, Bangladesh Ministry of Education came up with a new regulation bringing some changes to initiate the HSC admission program in a sophisticated way. The application process of HSC admission 2016 will be ended on June 9 this year. According to the new regulation, each candidate can select ten colleges in total as his/her preferred places to get admitted. Earlier college choice was limited to 5 only. Each and every candidate has to select the college in a chronological order based on his/her priority. 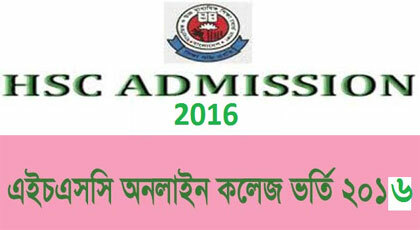 The guideline of HSC admission 2016 has already been uploaded in the official website of Bangladesh Ministry of Education and interested people can find it there. Online application fee is 150 taka. Students have to visit the site and fulfill all the instructions as mentioned there. For mobile application via SMS, the fee is 120 taka. No admission test will be held in this year to allocate the seats of the colleges. The selection process will be completed based on the GPA of SSC exam. In case the GPA is same for multiple candidates then their number will be checked. In total 89% seats will be kept for all where 11% quota will be kept for children of expatriates. And 0.5% quota will be kept for student who came from BKSP. HSC admission first merit list will be published in 16 June, The admission will take place between 18 to 30 June. But late fee admission will be accepted from 10 July to 20 July and classes will be held from 10 July 2016. Session fee will not be more than Tk 1000 in suburban or upazilas and it can be kept Tk 2000 in Pourashova area. All other metropolitan area’s except Dhaka college authority can keep Tk 3000 while MPO enlisted institutions in Dhaka can keep Tk 5000 taka. English version can keep Tk1000 as HSC admission fee 2016.